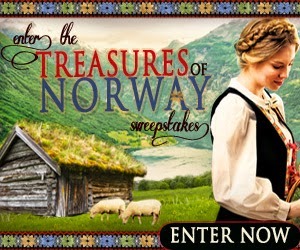 Treasures of Norway SWEEPSTAKES by Lauraine Snelling! 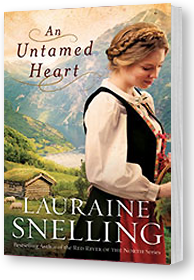 To celebrate the release of her new novel, An Untamed Heart, author Lauraine Snelling and Bethany House Publishers are pleased to present the TREASURES OF NORWAY Sweepstakes, and your chance to win one of three spectacular prizes, all closely connected to the story. Twenty-year-old Ingeborg Strand is certain she is destined to be an old maid. She’s had several suitors but none she deemed worthy of spending her life with. That is, until she meets a university student from Oslo, and feelings stronger than friendship begin to develop between them. But tragedy strikes, and the future begins to look bleaker than ever. Grief settles heavily over Ingeborg, and her mother suggests that she leave Norway and start afresh in America, as so many others have done before her. But how will she accomplish that with little money and no one to accompany her? It isn’t long before she meets Roald Bjorklund, a widower who has been planning to go to America for some time, lured by the promise of free land. He’s a good man, a hard-working man–and he has a young son who desperately needs a mother. He’s clearly interested in Ingeborg, but is he the answer to her prayers? And what about love? This isn’t how she’s always imagined it. TO ENTER, click the banner below and complete the entry box, anytime between October 5 and October 24. Check out these amazing prizes!! In An Untamed Heart, young Ingeborg Strand is tasked with cleaning her Onkel Frode's house, an ominous task indeed! But Ingeborg never backs down from tough tasks, and the result is a house so clean, any woman in Norway would be proud to call it home. 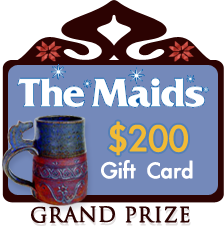 We might not have the luxury of a housecleaning visit from Ingeborg, but our Grand Prize winner will win the next best thing: a $200 housecleaning gift card to Maids.com, plus a handmade Tokheim Fjordhorse Mug and a bag of Ingebretsen's Viking Coffee so you can brew a cuppa, sit back, and relax while your house is transformed. Ingeborg and her cousin Gunlaug are some of the best cooks in the in the mountain village of Valdres, Norway. Cookies, cheeses, flatbreads, jams...their cooking and baking is a culinary-lover's dream! 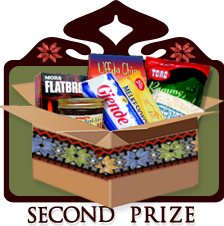 Our Second Prize winner will have Gunlaug's and Ingeborg's favorite Norwegian foods delivered right to their door with this $120 Norwegian gourmet prize pack. This package includes fresh Norwegian lefse, cheeses, flatbread, Nordic butter, jelly, Romme Grot cream porridge, Gjende shortbread, Uff Da chips, Fattigman cookies, and Norwegian chocolate. Ingeborg and the Strand family prepare for Christmas with music and handmade decorations, while secretly weaving and carving special gifts to give each other in celebration of Gott Jul. Our Third Prize winner will have the chance to bring Gott Jul to their home this holiday season, with this $100 Christmas In Norway prize pack. 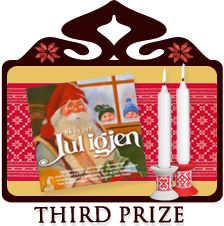 This prize includes a Norwegian Christmas CD, a set of 2 Norwegian wood spool candle holders, and a woven, 14" wide x 43" long, Åttebladrose Christmas table runner, perfect for dressing your dining table in the warm colors of Norway. This giveaway starts October 5, 2013 and ends October 24, 2013 @ 11:59 pm (PST). Entry is open to US residents only, age 18 and over. Winners will be selected Friday, October 25, 2013, and announced at laurainesnelling.com. Welcome to the Litfuse Blog Tour for The Journey of Josephine Cain by Nancy Moser! When a socialite from the nation's capital embarks on a journey to the Wild West, her life is changed forever. I've read a couple of Nancy's books, and some have taken more effort to 'get into' than others. I felt that way with Josephine's story. The words just didn't grab and hold my attention. It was easy to set the book down, and I wasn't anxiously awaiting a moment where I could pick up the story again. Josephine herself was a bit hard for me to like. She's a bit spoiled, rash, and bull-headed, and though she grows and changes as the story progresses, I had a hard time connecting with her through most of the book. 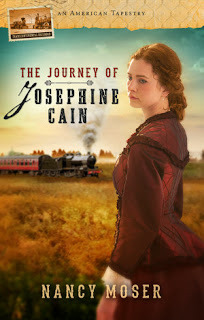 I enjoyed learning about the progress of the railway after the Civil War, but overall, The Journey of Josephine Cain wasn't a 'keeper' book for me. That's what I thought! Click HERE to see what other Litfuse reviewers has to say! Thank you to Nancy and Summerside Press through Litfuse for sending me a copy to read and review! Did you find my review helpful? Please rate it on Amazon and Christianbook! This week, CFBA introduces A Bride for Keeps by Melissa Jagears! A Tender Tale of Love on the Prairie! I've always loved a good mail-order bride story, and A Bride for Keeps did not disappoint. Often the bride or groom have some sort of painful past to overcome, resulting in a struggle to let go and love the other. Melissa's story was unique in that both Everett and Julia are hurting. One fears rejection, the other feels worthless. When one finally begins to let the emotional walls crumble, the other is still not ready to accept true and honest love. A Bride for Keeps was warm and sweet, and I really enjoyed it! I look forward to more books by Melissa! Thank you to Melissa and Bethany House through CFBA for sending me a copy to read and review! 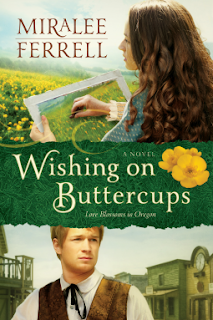 Releasing after the New Year, I had an early chance to look at Miralee Ferrell's second book in her Blossoms in Oregon series: Wishing on Buttercups. Can Love Survive When Secrets Collide? Beth knows that one day someone will unravel the threads of her past. And when two men from her past arrive, the truth might just hurt... Beth’s future and her heart. As shadowy memories surface, Beth sketches the scenes she sees and is shocked by what—and who—her illustrations reveal. Dare she risk her heart again? Once again, Miralee weaves an important topic into her story – this time, trust and past scars, both physical and emotional. The characters were great – couldn't help enjoying Mrs. Cooper and Aunt Wilma's interactions – and the whole paint incident was downright humorous (even funnier that it was based on facts)! It's so hard to imagine searching for a loved one in that day and age. Nowadays, it's almost impossible NOT to be found, thanks to the internet! The strain of both Beth and Mrs. Mason's search was palpable and I couldn't help turning the pages, hoping the impossible would right itself! The tension of romance and trust was also real in regard to Brent and Jeffery. Wishing on Buttercups was a very enjoyable read, and I can't wait to hear Steven's story in Dreaming on Daisies! Thank you to Miralee and David C. Cook through NetGalley for sending me a copy to read and review! 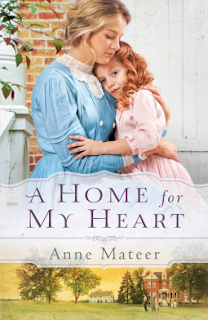 Thanks to NetGalley, I had the opportunity to read Anne Mateer's newest book, A Home for My Heart. Sadie Sillsby works as the assistant to the matron at the Raystown Home for Orphan and Friendless Children, pouring all her energy into caring for the boys and girls who live there and dreaming of the day she'll marry her beau, Blaine, and have children of her own. But when the matron surprises everyone by announcing her own engagement, Sadie is suddenly next in line for the esteemed job of running the orphanage. There's one glitch. The matron cannot be married. She must focus her attention on the financial, legal, and logistical matters of the Home. Sadie's heart is torn. Should she give up her plans for a life with Blaine in order to continue serving these children who have no one else? Does she, a young woman who was once an orphan herself, have what it takes to succeed in such a challenging career? And when the future of the Home begins to look bleak, can Sadie turn things around before the place is forced to close forever? It's been a long time since a book made me cry...and A Home for My Heart gave me a case of the sniffles! This is the second book I've read by Anne – I read and loved Wings of a Dream (which also made me cry)! In A Home for My Heart, Anne captures the struggle between duty and love in a realistic and tender way. I empathized with Sadie, because I've got a pride problem, too! It can be so difficult to humble yourself and give up jobs that you are capable of doing to others who are God-gifted in the task, despite their appearance or background. The entire story flowed so well and the characters were genuine and easy to love (or be frustrated with, depending on the moment). I read it in less than a day and loved it! AND FOR YOU, a peek into the book HERE. Thank you to Anne and Bethany House through NetGalley for sending me an ebook to read and review! As the British and Continental armies wage war in 1781, the daughter of a wealthy Virginia plantation owner feels conflict raging in her own heart. Lydia Caswell comes from a family of staunch Loyalists, but she cares only about peace. Her friend Sarah Hammond, however, longs to join the fight. Both women's families have already been divided by a costly war that sets father against son and neighbor against neighbor; a war that makes it impossible to guess who can be trusted. 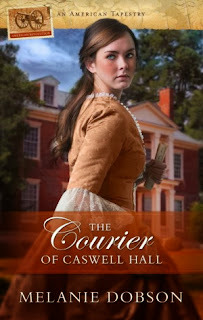 I was enjoying the Early American time period of The Courier of Caswell Hall as well as the intrigue of spying (women, especially!) for the war. However, I was sorely disappointed to encounter swearing halfway through the story. The word was not used in a biblical manner, like a preacher referencing judgment. I could not see any reason why the word had to be used. Unfortunately, one word ruined a whole book for me and despite my past enjoyment of Melanie's books, I could not finish or recommend The Courier. That's what I thought. Check out what other Litfuse reviewers had to say HERE. Thank you to Melanie and Summerside Press through Litfuse for sending me a copy to read and review!